At first glance, the cost of the entry ticket may seem rather high, but, a visit to the Casa Batlló is definitely not to be missed. We are talking about a truly unique experience, not just about a simple visit, because of the beauty of the building and also because of the really informative audio-guide which will help you to make the most of your visit. It is recommended to buy your entry tickets in advance as there can be long queues at the ticket office. The Casa Batlló is located on the Passeig de Gràcia, one of the most important avenues in the city which is also known as "the Modernist road." The building's brilliantly coloured façade is truly eye-catching and immediately draws the attention of every passer-by. Many people aren't aware of the fact that a large part of the building is still inhabited today which means that it is only possible to visit the roof terrace and one of the apartments (which has a balcony overlooking the street). When visiting the interior of the building, you will be mesmerized by the striking use of colours and the undulating shapes and you will be able to fully appreciate Gaudí's extraordinary artistic sense in his fantastic design with its constant references to the animal kingdom. 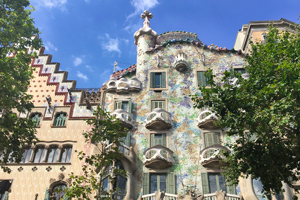 Deciding to visit the Casa Batlló entails a visit to one of the most beautiful works of the famous Catalan architect. You will be enchanted by the peculiarities of the building from the smallest details to the famous dragon which resides on the roof terrace. This is included in the entry fee and upon arrival, you will receive a video-guide which you can use straight on your smartphone. This is a high-tech system which combines elements of enhanced and virtual reality. Thanks to this system, you can see on your mobile: the furnishings and décor of times gone by on the main floor and many other surprises which will make your tour of the building even more interesting. And the other alternative which is the entry tickets entitled "Be the First" for those who prefer the early morning and quiet places without all the hustle and bustle of too many tourists. On the day of your visit, show the entry tickets on your smartphone at the entrance to the Casa Batlló.